IN A QUIET corner of Patna — surrounded by news of flooded roads, kidnapping and government apathy — six housewives would rather see the brighter side of the state. 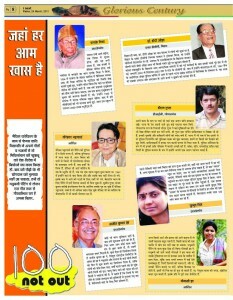 They have started an e- newspaper in Maithili that aims to bring to fore the positive aspects of Bihar. 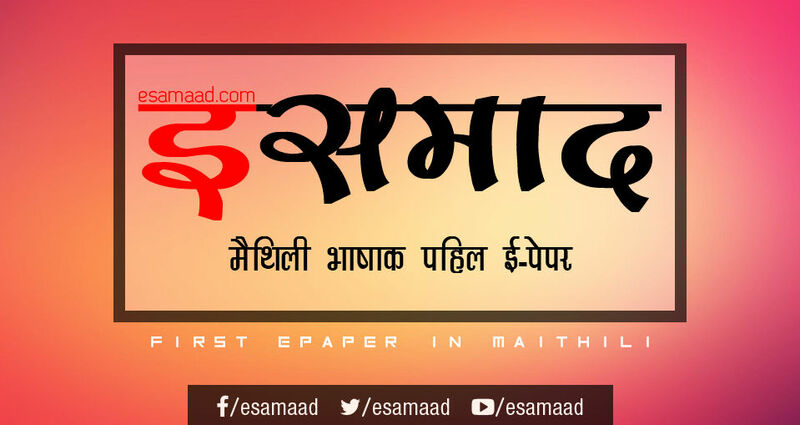 To be launched on Independence Day, Shamad — message in Maithili — is the first e- newspaper in the ancient language spoken by around three crore people in the world. The beta version will run on a shoestring budget of Rs 1,100 per month and is already available on shampadak. wordpress. com . The journey hasn’t been all that easy for Kumud Singh, Preetilata Mallik, Mamata Shankar, Susma and Chhavi, especially because they don’t have any experience in journalism or publishing content on the web. Besides, three of them have children and joint families to take care of. The sixth person in the group wishes to remain anonymous. “ But it’s been exciting and enriching,” says Singh, who is the web publication’s editor. Despite having studied only till Class XII, she is leading a group of women graduates. Not only is the editorial panel made up of only women, they prefer to use shamadia ( correspondent) for the stories instead of giving their bylines. Together, with the help of Singh’s husband and Delhi- based journalist Ashish Jha, the Patna homemakers plan to position Shamad as a weekly newspaper on the web. They’re also planning a print edition once the virtual avatar acquires readership. “ Women will be the torchbearers of a new Bihar,” says Jha, who recently shifted to the Capital from Patna. “ This e- newspaper will be a tribute to the rich cultural heritage of Bihar as well as the beautiful Maithili language.” Jha works for a Hindi newspaper in Delhi, but his heart lies in promoting his mother tongue. He has been mentoring Shamad ’s editorial panel and feels they are now ready to make things happen on their own “ even though we miss our deadline most of the time”. One of the core beliefs of the group is that the newspaper must concentrate on Bihar’s development and not its backwardness. Some stories published on the website include one written by a local leader of the Communist Party of India ( ML), Kumar Anil, titled Macaulay, not Mao rules Jehanabad . Another story is about how five internet cafes are changing the lives of villagers in the remote hamlet of Kakraul in Madhubani district. A third features Katihar, an area known for annual floods, but is now host to a medium- scale BPO that employs more than 150 locals. “ Shamad will try to negate Bihar’s feeling of nothingness in a language that has found very little financial support over the years,” said Jha. True, there have been few Maithili publications in Bihar and one of its most prominent — Mithila Mihir — shut shop in the 1980s after its promoters backed out due to lack of advertising. Today, there exist very few Maithili publications, some of the last ones being Antika and Videh . Several stories are also sourced from local magazines, television stations and news agencies. In some cases, Jha and news editor Mallik’s husband, Mithilesh, provide additional inputs. “ This is one of the many ways we could serve our language. We thought we should do something before it is lost forever,” says Mallik. However, the six housewives have maintained a fine balance between home and work. “ Our families have been supportive,” says Mallik. 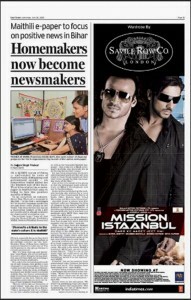 Despite being a unique venture, the e- newspaper has attracted some criticism. “ Some have termed us onesided, while others say we are the state government’s mouthpiece,” says Jha. Susma wrote in her edit piece, “ We believe in publishing what isn’t there in other dailies and magazines.” Not surprisingly, her edit is titled Hajir chhi hum ( We have arrived). Pahile ham wordpress bala par ekra nahee kholi payal chhalanhu. Muda anha sab lagal chee se jani prassanata bhel. Ashishke t ham jainit chhiyainhi Ranchi Patnas muda ee Maithilaneek samad achhi se ekhnahi bujhlanhu. Jaya Jha, IIT,IIM,Bangalore jabat Google me chhaleeh Bangaloreme sampark me chhaleeh,yadi oho ehi san jutal chhathi t bahut khushee.Pata nahee aab kanha chhathi? Maithilime aab Mithila samad namk daily Kolkata san ek varsh s neklait achhi. Nepalme Mithilanchal dainik delhlanu tathapi e-paperk avashykta t rahbe kartaik. Mithilk vikas ho ona jabat Mithila prant nahee banat ee kathinahe achhi. Maithili is going to long live. When our mothers are committed to promote the matribhasha then no one can stop the success. Vidyapati was only a writer who express his feelings in his mothertongue and these are the mothers who kept these feelings flowing til date on different occassions by singing the songs and talking with coming generation. Songs of mithila , culture of mithila and language of mithila will gain it,s due right. Your efforts assure me a lot. Bahut neek lagal, aanga badhait rahu. http://www.esamaad.com is very informative. The article is very professionally written. I enjoy reading http://www.esamaad.com every day. Bahut badhiya laagal. Ham jaahi cause par vaastav me Mithilaani sabh ke lel kaaj kay rahal chhi, Dahej Mukt Mithila nirmaanaarth, tekar sapana jena e samvaad padhi puraa hoit dekhlahu. Avashya Mithilaani jatek swaabalambi banati tatek jaldi Mithila dahej ke daanav ke changul sa mukt hoyat. Sangahi ehi trend ke aha sabh badail rahal chhi je Mithila ke news Maithili me dela sa paathak kam chhaik…. paathak bahut chhaik takhan ne aha sabh ke mehanait aai etek sundar rang anane achhi. Haardik shubhakaamanaa je aha sabh din duguni raait chauguni pragati karait rahi. Mithil bhasa ke le je aaha sab ka rahal chi okar lel bahut bahut dhanayaad. Bahut samay se Maithil bhasa ke vikas ke lel kunu saharaniya kaaj nai bhel rahe. Lekin aai ie jaain ke bahut khusi bhel ki aapan bhasa maithil ke visay me ab har ghar ,sansar ke har kona se milat. Bihar ke baare me prya log bhojpuri se janayat chai Maithil ke baare me te kyio vises janayet nai chai..home ja log ke kahiye.ki hum maithil chi aur maithili language hamar mother tounge aaich to log kahe e kun bhasa chi. Jaa kaih ke sunaibai chi log ekra bengali se jodait chai. Ate hum ja kahie ke hum maithil Mithila Janakpur ke hai..ta jaane ki maithil language chai. Is sab hamar chennai ke anubhav chi. Aia Bahut khusi bha rahal e sab dek ka. AAha sab ke bahut bahut dhanayabad. मन हर्खित भेल, छब्बो मिथिलानी के अंशु मिथिलानीक करबद्ध नमस्कार छैन्ह ।! शुभकामना!